It’s always fun to look up at Earth’s closest neighbor and indulge some curiosity about the Moon, but tonight’s a special night to do it: it’s International Observe the Moon Night. The celebration, sponsored by an array of scientific and educational organizations along with some dedicated Moon enthusiasts, has prompted a wide variety of events all over the world. You can find one near your home if you visit this webpage. If you’re looking for your own activities, obviously a good place to start is by going outside and observing Luna. You don’t even need a telescope. If the night sky is clear, the naked eye will allow you a good view of lunar maria, or “seas,” and the Moon’s highlands. If you use binoculars, attach them to a stand or tripod if you have one. The Moon is at first quarter phase tonight, so it is not likely that an observer will be able to see the phenomenon known as Earthshine, in which the night side of the moon is visible when sunlight reflects off the surface of Earth. Earthshine is visible only when the Moon is at or near new moon phase. After you’ve looked at the Moon, it might be fun to try your hand at this Mission Moon activity. Participants work in teams to figure out the best place on Luna for a base. The activity is suitable for kids from about third grade and up. You can also try the Moon Mappers activity. Before going outside to have a look at our closest celestial neighbor, you might enjoy watching this NASA video about how the Moon formed and its history. 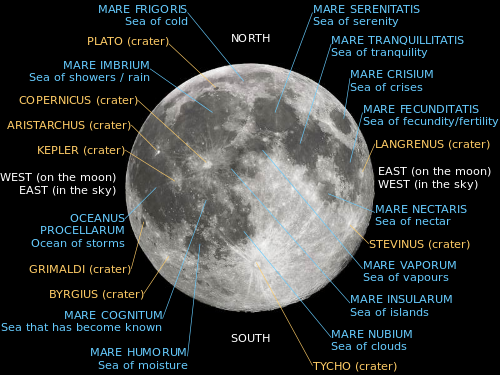 Labeled Moon map courtesy Wikimedia. Note: This story also appears at Examiner.com.